Deluxe leatherette holster for RUNT stun gun designed with a more attractive look than your standard nylon holster that comes with the stun gun. 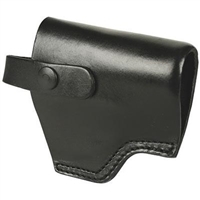 The holster has a heavy duty belt clip and a ring to hang the holster. The magnetic clasp will hold the stun gun in your holster and makes it easy to get to when needed. Nylon/Velcro holster with Belt Loop for Wildfire 18% sprays - 9 oz.. Will fit either Guard Alaska Bear Spray and Bear Pepper Mace® Spray. MACE PEPPER GUN Nylon Holster with snap closure and belt loop. MACE PEPPER GUN Leather Holster with snap closure and belt loop.